Posted on December 29, 2011, in Critiques, Theories, and Random Thoughts and tagged evolution, mermaids, ocean life, science fiction. Bookmark the permalink. 3 Comments. Do you go around telling kids that Santa Clause isn’t real either? I just don’t see the point… I think it’s an interesting line of discussion as to how merfolk would work, which is how I ended up hear, but there’s a sneering tone I don’t like here. I Think most of us know Mermaids don’t exist and would likely require their own awkward category and unique circulation system. It would have been a better use of time to try and see how that might work, instead of trying to sell us your basic squid people nobody cares about(even you, since you didn’t bother drawing a picture). Gosh. Hit a nerve, didn’t I? So, if I understand you correctly, you think the line of discussion is interesting, but you don’t like the tone. You would have preferred it if I spent time explaining why mermaids *would* be plausible instead of discussing why they aren’t. 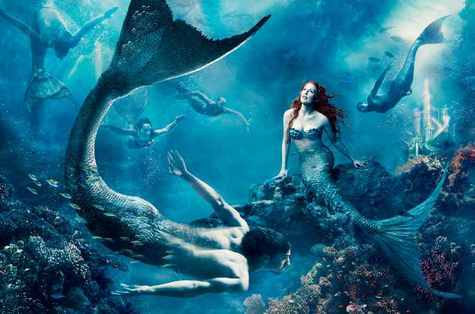 Of course, I don’t think mermaids are plausible, so that’s a bit of a hang-up in that line of conversation, isn’t it? That is the point, ultimately. No mermaids, at least in any physiological sense. They still serve as anthropomorphic humans for symbolic and metaphoric purposes, sure, but just as Santa Claus cannot physically deliver presents everywhere without warping space/time (which, were he real, he’d presumably be able to do), so too will mermaids have blubber and no muscular arms. Or possibly really thick fur, like an otter. Oh, and if we’re talking tone here, I *might* be sneering a bit (fair enough, since mermaids are silly), but you are overtly hostile. Of the two, I’d rather a bit of sarcasm.